It was teased at this year's CES demonstrating VoLTE calls, we saw it working in a reference design, and today, Broadcom is finally ready to make their first LTE-enabled baseband official, dubbed BCM21892. This is again Broadcom's eagerly anticipated launch LTE baseband, and supports a pretty impressive set of features for their first entry. BCM21892 includes support for GSM/EDGE, WCDMA up to HSPA+ 42.2 (DC-HSPA+), TD-SCDMA for China, and UE Category 4 (150 Mbps on the downlink) LTE-Advanced with both TDD and FDD duplex modes. There's no CDMA2000 1x/EVDO which is pretty much expected, but more on that in a moment. BCM21892 is a 3GPP Release 10 part, which is again the LTE-Advanced release that includes things like LTE carrier aggregation inter and intra band. Broadcom tells me they will support carrier aggregation modes for LTE, and WCDMA. MIMO support on BCM21892 is 2x2. In addition, there's support for VoLTE calling (which we saw demonstrated) and 3G fallback modes for migrating that call over to WCDMA and GSM as necessary. In addition Broadcom claims they have enough performance to run an operator's IMS stack entirely on their baseband. BCM21892 is built on 28nm HPm process, which is the TSMC High-K Metal Gate for Mobile. Broadcom claims that their total solution area is 35 percent smaller than their main competition. I asked for a total package size, but they're not quite ready to disclose that. Another interesting tidbit is that Broadcom is including their transceiver inside the baseband package. DRAM is also inside the package, which is pretty common these days. 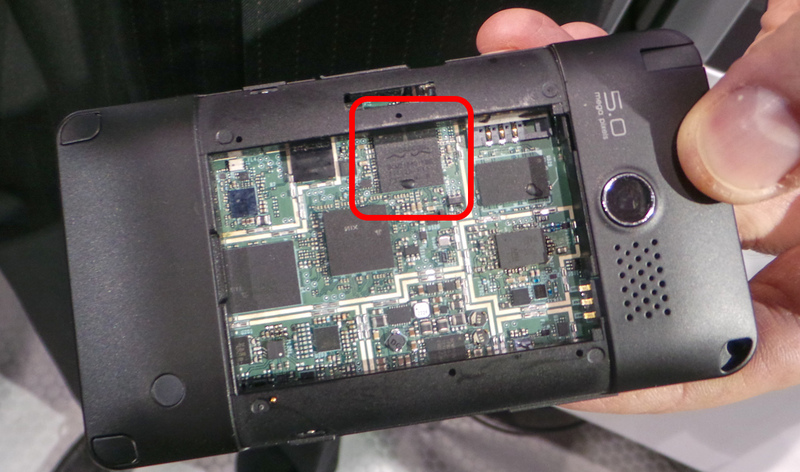 There's still an external PMIC/PMU, which is also Broadcom's own design. Interestingly enough Broadcom claims it can do 8 bands (I'm assuming they're talking about primary receive) on its transceiver, which is one more than Qualcomm's 7 primary Rx ports on WTR1605/L. I asked about the low / mid / high / very-high configuration for Broadcom's transceiver, but they're not quite ready to disclose that information. There's no GNSS/GPS support on BCM21892 at the moment, Broadcom envisions customers using one of their discrete GNSS devices for this, since their WLAN/BT/FM/NFC combos also don't include GNSS support. It isn't too much of a stretch to picture GNSS moving onto the baseband with some future revision, however. I saw a slide at CES which noted support for envelope tracking, which BCM21892 indeed includes support for officially now. Broadcom claims that support for envelope tracking among other things will give them a 25 percent power savings over competitors without it. Without going into too much discussion, envelope tracking involves varying the drive voltage for transmit power amplifiers depending on the amplitude (envelope) of the desired signal for maximum efficiency. We will see other players also start talking about envelope tracking soon as well. I asked Broadcom about what it views is BCM21892's market differentiation, and it comes down to three things. First is again package size, which is 35-37 percent smaller as noted, second is envelope tracking which I touched on, and third is perhaps the most interesting – improved coexistence and collaboration with Broadcom's combos (BCM4330/4334/43341/etc) on the unlicensed 2.4 GHz band and nearby adjacent licensed bands. This is particularly important or interesting for Dish Networks and AT&T for example, on the WCS band at 2.3 GHz. The last real big remaining question is what Broadcom will do in the USA where having CDMA2000 1x/EVDO is a relevant discussion point for operators like Verizon Wireless or Sprint. The answer is that for at least Verizon, the goal is to get LTE (and later, LTE-A) on Band 13 (and later 4) up to parity with existing CDMA2000 coverage profiles, and then use VoLTE for voice. For data, we're already seeing the result of some of the newer RFPs (Request For Proposal) which don't even include CDMA2000 as a requirement, for example Samsung Galaxy Camera on Verizon which is solely band 13 LTE. It isn't entirely surprising to see CDMA2000 support become something of a non-issue by end of 2013, early 2014 when Verizon finishes its LTE rollout. I noted it in my writeup from the CES VoLTE demo, but there's no surprise that Broadcom chose Verizon's Band 13 for its VoLTE demo given that situation. The rest of the discussion is operator and OEM support, which Broadcom claims is enthusiastic and already heading into field trials. The market at present for smartphone connectivity with LTE has really been dominated by Qualcomm, and Broadcom entering the fray with a competitive offering should make things interesting. Timing wise, BCM21892 is sampling right now, with production in early 2014. I think a year from now is overly optimistic for removing CDMA support from new VZW devices. Verizon's network will be LTE everywhere; but there are still a number of holes where they're dependent on roaming deals with other carriers because they don't have any 800 mhz (voice) spectrum in the area. At least in the one relatively near to me (western Maryland, eastern West Virginia, western Virginia), where they're dependent on roaming access to US Cellular's network for voice they never built a 3g data network despite several major interstates (I68, 79, and 81) running through the area. The problem isn't that there will be holes. It'll be that Verizon thinks they can do whatever they want and people'll just deal. The problem is in the fact they're mostly right. Our government protects companies like these from having to really compete and so they feel they're too big to fail. Not only because of government setups that protect wireless companies, prevent buyouts/mergers, protect ISP's from having to lower prices against competition even against municipal-based ISP's, but also because our government has proven once you get big enough, influential enough, "too big to fail," they can and will ignore anything you do including funding terrorism and Mexican drug trade. What is your complaint? You want VZW to support voice CDMA forever? Even if that means worse service for everyone else? VZW would love to do what you're suggesting since even a free smartphone requires a dataplan.
" In addition Broadcom claims they have enough performance to run an operator's IMS stack entirely on their baseband. " IMS consists of moving voice/multimedia messages to an IP based system. Then there is the GNSS, The Transceiver was packaged in which means less space, but then you required a separated GNSS/GPS which still makes it a two chip solution like WTR1605 and MDM9x25. And to make it worse they decide not to include it in their WiFi Combos. Those using Snapdragon will have no need for this, and if they are having other phone model not using Snapdragon and require a separate baseband like the Broadcom is offering, my guess is that buying Snapdragon along with its Baseband and Wifi Combo will be cheaper. So why not go after the single biggest handset manufacture that doesn't have its own Mobile Cellular Stack; aka. Apple. Well; three chip solution, early 2014 doesn't convince me much.